A man who claimed to have a bomb on board an American Airlines plane in Miami has been shot dead by US air marshals, officials say. 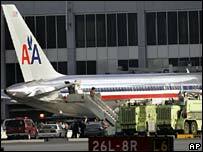 Rigoberto Alpizar, a 44-year-old US citizen, was killed in the air bridge after running out of the plane pursued by marshals who had broken their cover. No bomb was found on Mr Alpizar whose wife had tried to explain he had a mental illness, one witness said. It was the first time since 9/11 that air marshals had shot at a passenger. The US dramatically increased the number of air marshals on flights after the 2001 attacks. Local police and federal officers are investigating the incident, but officials say so far there is no hint of any links to terrorism. However, as a precaution, federal air marshals were deployed in airports across the country. Mr Alpizar had arrived in Miami, Florida, from Ecuador and was boarding a flight to Orlando at about 1410 local time (1910 GMT). Carrying a backpack and travelling with a woman apparently his wife, he had cleared customs and was boarding the Orlando flight, which had originated in Medellin, Colombia. "At some point, he uttered threatening words that included a sentence to the effect that he had a bomb," said Miami Federal Air Marshals official James Bauer. "There were federal air marshals on board the aircraft. They came out of their cover, confronted him, and he remained noncompliant with their instructions. "As he was attempting to evade them, his actions caused the FAMs to fire shots, and in fact he is deceased." Homeland Security Department spokeswoman Joanna Gonzalez said Mr Alpizar had fled from the aircraft through the air bridge going toward the terminal. "At that point, he appeared to be reaching into his carry-on bag... the air marshals took the appropriate action and that's when the shots were fired," she added. 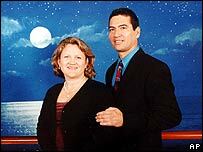 Mary Gardner, a fellow passenger, told local television that the man had run frantically down the aisle of the Boeing 757 screaming while his wife tried to explain he was ill.
"I did hear the lady say her husband was bi-polar and had not had his medication," she said. "I saw the woman... she was hysterical." Neighbours of Mr Alpizar in Maitland, Florida, remembered him as a "very quiet guy". He had, relatives said, been married to his wife Anne Buechner for about 22 years. Television images showed police and emergency response officers surrounding the plane after the incident. Investigators spread passengers' bags on the tarmac as sniffer dogs checked them for explosives. The airport later resumed normal operations.